Southeast Africa or Southeastern Africa[a] is an African region that is intermediate between East Africa[b] and Southern Africa. [c] It comprises the countries Botswana, Burundi, Kenya, Lesotho, Malawi, Mozambique, Swaziland, Tanzania, Uganda, Zambia and Zimbabwe in the mainland, with the island-nation of Madagascar also included. People include the San people. The Swahili language is spoken here, both as an official language and lingua franca by millions of people. 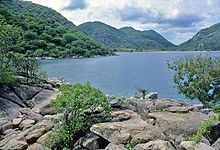 Lake Malawi and Limpopo River are located here. It is considered that approximately 3,000 years ago, Bantu peoples arrived in this area from what is now Western or Central Africa. In the 19th and 20th centuries, David Livingstone and Frederick Courtney Selous visited this area. The latter wrote down his experiences in the book Travel and Adventure in South-East Africa. Fauna includes the cheetah, leopard, lion, Nile crocodile, hyena, Lichtenstein's hartebeest and white rhinoceros. ^ Though this reference includes Namibia, it was previously referred to as "Southwest Africa", due to its location. ^ East Africa at least partially includes Northeast Africa. ^ Southern Africa includes what was known as Southwest Africa. ^ Axworthy, Mary (2004). Sowell, Teri L. (ed.). Asking for Eyes: The Visual Voice of Southeast Africa. University Art Gallery, San Diego State University. ISBN 0937097012. ^ Wieschhoff, H. A. (2013). The Zimbabwe-Monomotapa Culture in Southeast Africa. Literary Licensing L. L. C. ISBN 1494009935. ^ a b Schlebusch, C. M.; Prins, F.; Lombard, M.; Jakobsson, M.; Soodyall, H. "The disappearing San of southeastern Africa and their genetic affinities". National Center for Biotechnology Information. doi:10.1007/s00439-016-1729-8. PMC 5065584. PMID 27651137. ^ a b Turok, Ben (1990). Witness from the frontline: aggression and resistance in Southern Africa. Institute for African Alternatives. p. 86. ISBN 187042512X. ^ Jama, Abdillahi H. (2002). "11". Values in Islamic culture and the experience of history. pp. 303–322. ISBN 1135434166. ^ Bechaus-Gerst, Marianne; Blench, Roger (2014). "11". In Kevin MacDonald (ed.). The Origins and Development of African Livestock: Archaeology, Genetics, Linguistics and Ethnography - "Linguistic evidence for the prehistory of livestock in Sudan" (2000). Routledge. p. 453. Retrieved 15 September 2014. ^ a b c "Bantu Ethnicity in South East Africa: From Kenya to the Southern Tip of Africa". Ancestry.com. Retrieved 2018-04-29. ^ "Tracing African Roots: Exploring the Ethnic Origins of the Afro-Diaspora". Tracing African Roots. Retrieved 2018-04-29. ^ Fry, Kathie. "Southeast African Countries". Do It In Africa. Retrieved 2018-04-19. ^ "Freshwater Fish Species in Lake Malawi (Nyasa) [Southeast Africa]". Fishbase.org. Mongabay. 2001-11-15. Retrieved 2016-12-09. ^ a b Douglas, John (Summer 1998). "Malawi: The Lake of Stars". Travel Africa (4). Archived from the original on 2009-01-14. Retrieved 22 August 2008. ^ a b Selous, F. C. (2011). "XXV". Travel and Adventure in South-East Africa. New York: Cambridge University Press. p. 445. ISBN 1108031161. ^ Jackson, D. (2010). "Introduction". Lion. London: Reaktion Books. pp. 1–21. ISBN 1861897359. This African location article is a stub. You can help Wikipedia by expanding it. This page was last edited on 6 January 2019, at 01:50 (UTC).